Advertising is a field that requires immense amount of creativity and ideation that facilitates creating of spectacular looking advertisements and novel concepts that bombard our television screens presenting little stories woven around the specific product or service that is being promoted. As an individual sector, advertising sports a wide variety of tools and mediums that work for commercially promoting vast ranging products and services. Designing and creating print media advertising literature such as banners and pamphlets and flyers work exclusively for personalizing promotional efforts and concentrating them over the web has proved to be greatly constructive in making the net savvy user duly aware about the specific brands. 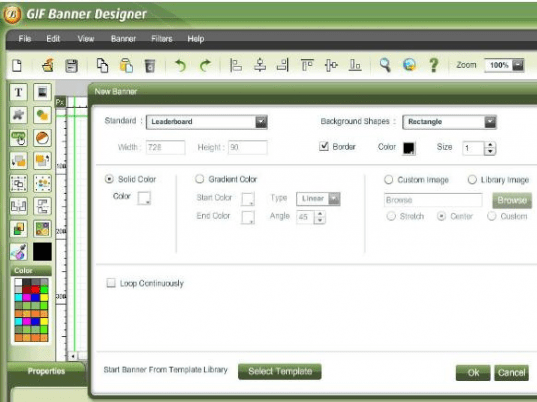 GIF Banner Designer 5.0 is a utility that easily helps the user to design and create banners in quick time with the help of its available templates. GIF Banner Designer opens with a vibrant looking interface with the main options placed at the top pane in the form of simple looking icons and the left panel displaying the tools for designing and coloring the banner ad that is displayed on the main screen. The program contains professionally designed templates for static as well as animated backgrounds and enables building banners in record time. There are wide varieties of choices available for size and layout of the banner and enables adding varied shapes and images to it and also provides vivid looking fonts for making the banner more and more attractive. Furthermore, there are vast color palettes available and insert some nice looking special effects too along with providing numerous editing tools that make the application totally flexible in use. To conclude, GIF Banner Designer 5.0 specifically helps the online advertiser in creating nice looking ads through the created banners and hence gets a rating score of four points for its impressive performance. Create DVDs using preset menu templates and customizable settings.